Republicans are busy passing anti-Hispanic, immigration laws in state after state. Typically, these laws include a provision requiring businesses operating in the state to use E-Verify, the government’s Internet-based work authorization system; even though it is well known that the system is severely flawed. Republicans say they are the friends of small business. Republicans say they are for smaller government. Republicans say they are opposed to taxes. Republicans say they want to create jobs. So, how well do these goals fit with E-Verify? 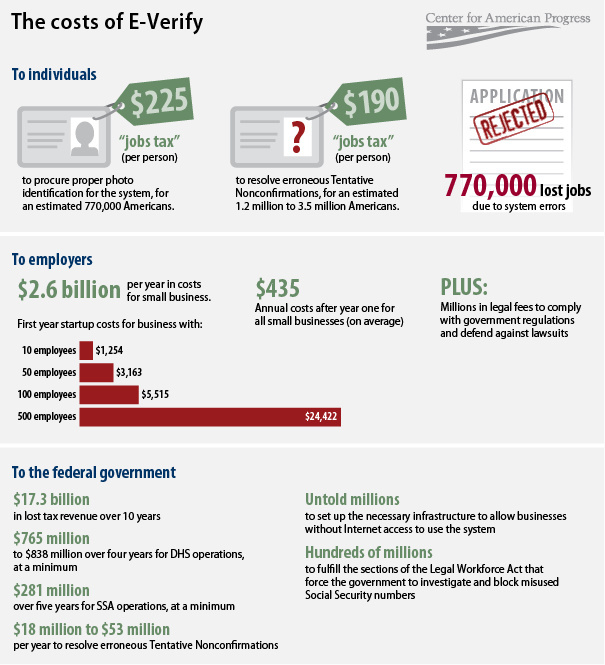 The Center for American Progress examined the impact of E-Verify on jobs and small businesses. Their conclusion: E-Verify expands the size of government while decreasing revenue, places a crushing burden on small businesses, and imposes a “jobs tax” on ordinary Americans.